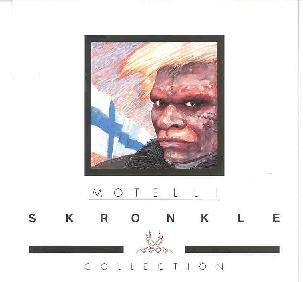 From Finland, Motelli Skronkle play a difficult to describe brand of what I guess I'll call out-rock. The music is raw, but the musicians can clearly play their instruments. The bass and drums are pounding, with the bass being something of a lead instrument along with trumpet. The vocals are somewhere between growling and chanting. Quite aggressive really. Kind of like a male Nina Hagen at times. The trumpet often plays cool jazzy lines that when combined with the tribal bass and drums and manic vocals makes for quite an interesting mix. Guitar is present as well though it's a secondary instrument. But there's really quite a variety of stylistic influences here, some of which the band mangle with welcome precision. Sometimes the music has a Ska-like feel, but also reminds me of some of the old avant-progressive (or RIO) bands. Others are far more accessible, though still have a nice raw but toe-tappin' feel to them. Most of the tracks are 'songs' in terms of structure, but despite their short length Motelli Skronkle manage to be musically adventurous without the need to stretch out and develop. The one exception is the 7+ minute "Kone", the last track on the CD. The song is a wee bit different from the rest of the tracks, being something of a droning industrial psychedelic out-rock tune. Even a bit Pink Floyd sounding at times, though readers shouldn't take that too literally in terms of the album as a whole. "Collection" consists of 22 tracks, most of which are in the 2-4 minute range. I assume the vocals are in Finnish, and I'm gathering from the liner notes that this collection represents three different lineups of the band. Long-time Aural Innovations readers know there are lots of unique bands in Finland and Motelli Skronkle are yet another example of one that is pushing the boundaries of rock music. For more information you can email Poko Rekords at pokorekords@poko.fi. Contact via snail mail at Poko Rekords; PO Box 483; FIN-33101 Tampere; Finland.